Get Caught Up in The Marriage Trap! First off, a huge thank you to my loyal readers. Because of you, The Marriage Trap shot to the New York Times and USA Today Bestsellers list in its first two weeks! I’m thrilled you are enjoying Michael and Maggie’s love story and romp through Italy. Your reviews and fan mail are humbling and I cannot express my gratitude enough. In the next two weeks, make way for The Marriage Mistake released in e-book and print everywhere on November 6th! Carina and Max will steam up the pages and make you want to adopt your own Mama Conte. I’ll be signing both The Marriage Bargain and The Marriage Trap at the Barnes and Noble store in Kingston, NY on Saturday October 27th at 6:30pm. If you can make it, please stop by to chat, pick up a signed book, and ask any questions. I love meeting my readers! I will also be doing an interview on our local radio station, WKNY at 9:15am tomorrow, Thursday, October 25th. Tune in and listen as I chat about the books and the connection to the Hudson Valley. Are you an audio fan? I am! You can buy the audio and listen to a FREE first chapter of both The Marriage Bargain and the Marriage Trap at the following links! To get in the mood for the holidays, my short sweeter romance The Holiday Hoax will be available for download everywhere on November 7th. Look for more signings, giveaways, blogs and contests as we gear up for the release of The Marriage Mistake! In the meantime, Happy Fall everyone! Congratulations Jennifer on the success of The Marriage Trap! I absolutely love these books and I can’t wait to read The Marriage Mistake. I’m counting the days until the release date. I wish I could make it to Barnes and Noble but it’s too far. Thank you so much, Linda! Am so happy you’re enjoying the series and I hope my next signing is closer to where you live so we can meet! I must really like the Marriage Bargain. I just bought it again for my nook. I am actually reading it agin. Niot something I do often with books. Can’t wait to read the other two books. Audrey you are the best! I am so happy you loved Bargain and can’t wait to hear what you think of the the other two! Thanks for letting me know. 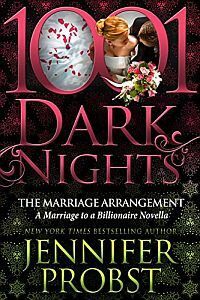 I recently read both of your books Marriage Bargain and Marriage Trap – also managed to read the Prologue/Epilogue/Deleted Scenes 1& 2 from Marriage Bargain – and I absolutely “loved” it. Will you be publishing Prologue/epilogue/Deleted Scenes etc from the Marriage Trap “PLEASE….PLEASE… PLEASE” can you I will so much be interested in reading more about Maggy and Michael. HI Tilo! So happy you are enjoying the series – I adored writing Trap and love Michael and Maggie. Yes, I will soon be providing some fun deleted scenes from the book and I promise you will see some great scenes with them in The Marriage Mistake! Stay tuned! I am also working on book 4 so the series will keep on going! Wow, will you be revisiting Alexa and Nick’s relationship after they get back on track….after he accepts the baby?! Will you keep the characters going for a while or will you explore more on family e.g. Carina and Max? Yes we sold the rights to Spain! Let me check when they will be issued for you to read in Spanish! Really enjoyed your first Marriage Bargain. Your second Marriage Trap I’ve also enjoyed up until page 216. This particular batch of books that were printed jump from 216 to 281 then the excerpt of Marriage Mistake, then at the end of the book it picks back up at page 249 till the end. Needless to say I understand this was not your fault but was frustrating to miss those pages towards the end. I’ve looked to see if other books at different stores had the same problem and they did. Also have not seen any other complaints so maybe it was just locally to the Joliet, Il area. Looking forward to reading your last book Marriage Mistake. Hopefully there won’t be any mistakes in the printing as well.